On this page you will find links to documents and resources on disaster mitigation, preparedness, response and recovery. FEMA 2017 National Household Survey. 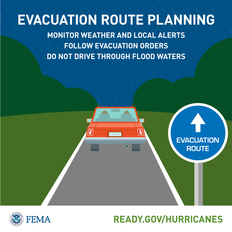 FEMA 2018 National preparedness Report. Click here to read an update of what is happening. If you are not already part of your parish’s or community’s flood response program, contact your local officials to find out how you can help. Hopefully, you will have a Communities Active in Disaster (COAD) organization in your area. Again, check with your local officials, or United Way, Chamber of Commerce, or county emergency manager for information. The theme of this September’s National preparedness month is: Disasters Happen. Prepare Now. Learn How. Now is the time to think about our parish preparedness, our personal preparedness, while as Christians, we plan to help others protect their lives, property, and belongings in advance of a disaster.